A Financial Harm Strategy for Dumfries and Galloway has been launched, which is an action plan intended to tackle head on the perpetration of financial abuse, which includes theft, fraud and other scams used in the misappropriation of property, possessions or benefits. “Crime relating to financial harm is now so widespread that unless we all work together to tackle it, we will never be able to stop what is fast becoming a tide of criminality which is impacting on our communities on an almost daily basis” explains Chief Inspector Stephen Stiff of Police Scotland. Speaking at the launch Chief Inspector Stiff said “the many methods used to commit these types of crime can be extremely complex and varied. Those affected are not just those who might be seen as vulnerable in our communities. Scams can be carried out through the internet or by e-mail, written correspondence, telephone calls, personal cold callers and bogus workmen as just a few examples of the many types of crime that are being committed against communities in Dumfries and Galloway, and indeed right across Scotland. “Many crimes are committed by people overseas or from out-with Dumfries and Galloway so tracing the criminals can often be extremely challenging. Nevertheless we will use every mechanism available to us to bring offenders to justice, but a large part of our plan is aimed at making it more difficult for criminals to operate in our area in the first place. Our plan will ensure that staff working within statutory emergency services and the local authority, health professionals, care professionals, voluntary agencies and our partners in the commercial and private sector such as banks, post offices and retailers work together more closely than ever, are better informed and better able to spot the potential for crime before it happens and we will work together to support victims where a crime is committed. “Sadly it’s no longer so much about IF someone attempts to involve you or someone close to you in a scam but WHEN. Our strategy aims to empower people to make the right choices when they receive that call, text, e-mail or are approached on the door-step and it’s really important that we all work together to ensure criminals don’t succeed in our area. Figures obtained through research show that almost 92% of people surveyed have received nuisance phone calls, 68% have received unwanted mail or post, 51% have been targeted by unwanted e-mails and 43% had unwanted callers at their door. “We want to encourage people to start conversations within their own families and amongst friends and neighbours about the risk of financial harm and the dangers that scams pose. The health and wellbeing of our communities is important to everyone and our aim in getting this strategy launched is to encourage everyone to work together to help keep our communities safe, and to feel safe, as they go about their business. • Staff awareness training across a host of agencies to allow them to identify and prevent cases of financial harm at an early stage, including Dumfries and Galloway Council, NHS Dumfries and Galloway, banks and building societies, utility providers and voluntary organisations. • Information sharing between organisations and agencies in the region to ensure everyone is aware of current trends and methods of carrying out many of the scams and schemes which are being used in the region. • Public awareness raising programme to ensure that everyone in the region is informed about the risks and dangers posed through financial harm scams, thefts and frauds, and feel empowered to take early action when these crimes are identified. • Heightening of awareness amongst enforcement agencies, including information sharing around criminals and their methods to maximise the disruption and apprehension of perpetrators. “This type of crime is clearly on the increase across Scotland and here in Dumfries and Galloway we are not immune from any of these types of scams, thefts and fraudulent schemes. In 2018 officers in the Division have dealt with a large number of high value scams and frauds, which in some cases have netted as much as £40,000, £60,000 and £70,000 for the perpetrators. These are serious amounts of money which impact on the long term wellbeing of individuals and their families. Crimes or attempted crimes are occurring in a street near to you, almost on a daily basis. Help us to work together and tackle this type of crime head on by starting, and keeping going the conversation about this horrible type of crime, its effects on our communities, and the ways in which it can be identified and dealt with. “In the weeks and months ahead, you will see posters in public places and officers engaging within communities, town centres and shopping areas to talk about financial harm. Professionals involved in delivering public services will be working to reduce the likelihood of crime in our area and Police Scotland and partners will be sharing information about the most recent scams to help people avoid falling victim. We will also be working with all of our partners to make best use of technology to prevent harm. Please engage with us and help us tackle this type of crime as a unified community against scams. 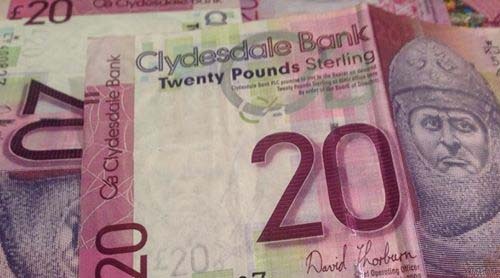 If you have any concerns about financial harm or are concerned about a family member, friend or neighbour, help and advice can be sought through your local community policing officer or through contacting Trading Standards, Dumfries and Galloway Council or your bank, building society or carer as appropriate.